Our Young MasterMario Blanco, the second child of the famous artist Antonio Blanco, was born in Ubud - Bali on the 4th of July 1962. He was surrounded by art from early childhood. Without doubt, his father Antonio Blanco was regarded throughout his life as the most famous artist of the island of Bali. When Mario was very young, the elder Blanco invited him into his studio in Campuan to share in his great enthusiasm for art. Mario painted his first oil at the tender age of five and later chose to study art at the University of Udayana in Denpasar where he successfully graduated. Nevitably, Mario's art drew its inspiration from two different origins. 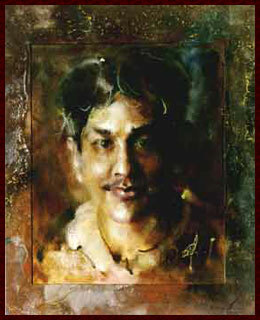 His Spanish father introduced him to the techniques of European art and his native artistic feelings come from his Mother Ni Ronji, a famous Balinese dancer. Mario has developed this intensively through his paintings which expose a definite preference for a romantic impressionistic style. Being the son of the "Fabulous Blanco", Mario faces a strong challenge but, as he inevitably sheds his father's influence, his own talent is expressed through an elaborated landscape where his own visions of Balinese culture gradually emerge.